Pictured: Naval Base Commander, Commodore Jim Higham OBE ADC RN presenting Warrant Officer George Boardman RN with is Valediction after serving 42 years in the Royal Navy. ''''ROYAL NAVAL WARRANT OFFICER RETIRES AFTER SERVING LONGER THAN LORD NELSON''''THE ROYAL Navys longest serving Weapon Engineer (WE) Rating, WO George Boardman, will be presented his Valedictory Certificate by the Royal Navys most Senior Naval Officer in the WE branch, Cdre Jim Higham, onboard the longest serving Royal Navy warship, HMS Victory. ''''WO Boardman joined the Royal Navy in September 1976 as a Junior Engineering Mechanic, completing 42 years and 7 months service thats more time than Lord Nelson. ''''During his career he has fulfilled a myriad of roles across the Navy and notably in 2007 he was assigned to Iraq for Operation Telic as a Regimental Quarter Master Sergeant. 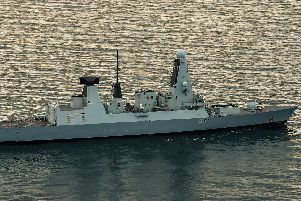 HE IS the Royal Navy’s longest-serving weapons engineering rating. But after 42 years and seven months in the Senior Service, Warrant Officer George Boardman has finally called it a day on his extraordinary naval career. Warrant Officer George Boardman and his wife Dorothy Boardman cutting the cake, after serving 42 years in the Royal Navy. His achievement was celebrated during a special retirement service on the Royal Navy’s oldest commissioned warship, HMS Victory, and attended by the fleet’s most senior naval officer in the weapons engineering branch, Commodore Jim Higham. Veteran sailor WO1 Boardman first joined the navy in September of 1976 as a junior engineering mechanic. Since then he has served on ships across the fleet, including Leander-class frigate HMS Juno, Type 82 destroyer HMS Bristol, Type 42 destroyer HMS Newcastle, Type 23 frigates HMS Sutherland and HMS Richmond as well as a handful of minhunters and shore bases, ranging from HMS Collingwood and the Fraser Gunnery Range, to Fort Southwick Transmitter Station and the Gibraltar Maritime Data Centre. During his career - which notched up more years than the Senior Service’s most acclaimed hero, Admiral Lord Nelson - he was also called upon to become the regimental quartermaster sergeant, assigned to Iraq during Operation Telic in 2007. Leading Diver Liam Boardman with his father Warrant Officer George Boardman as he receives his valediction for serving 42 years in the Royal Navy. Readwin who was also present for the valedictory ceremony on Victory. Capt Readwin said: ‘I had the privilege of serving with George as commanding officer of HMS Sutherland. George was instrumental in delivering the operational capability of that ship. ‘In live operations off Libya, George’s calm demeanour was exactly what we needed. What an absolute privilege to be here today at his retirement ceremony.